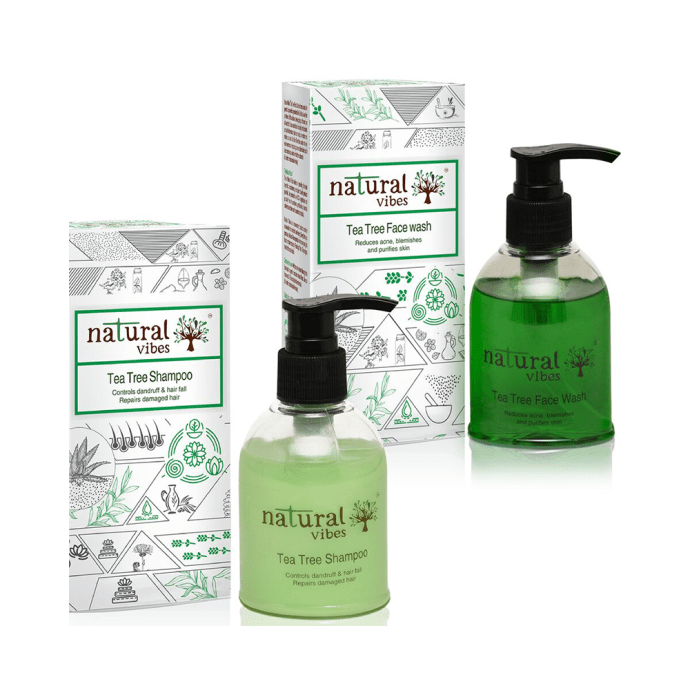 Natural Vibes Ayurvedic Tea Tree Face Wash and Shampoo Everyday Treatment is an ayurvedic combo product comprising of a face wash and shampoo. The face wash reduces acne, blemishes and dark spots on the skin and also lightens skin tone. The shampoo controls dandruff and hair fall and also repairs damaged hair and split ends. This 100% vegetarian product is free of paraben and phthalate and is certified by the department of Ayurveda. A licensed pharmacy from your nearest location will deliver Natural Vibes Ayurvedic Tea Tree Face Wash and Shampoo Everyday Treatment. Once the pharmacy accepts your order, the details of the pharmacy will be shared with you. Acceptance of your order is based on the validity of your prescription and the availability of this medicine.